In use together, this power product duo uncovers more radiant, moisturized skin while promoting evenness of skintone. Good Genes All-In-One Lactic Acid Treatment exfoliates and moisturizes the skin while smoothing the appearance of fine lines. Luna Sleeping Night Oil contains a powerful, yet gentle trans-retinol ester and moisturizing botanical oils to reduce the appearance of pores, fine lines, and sun damage while preventing flakiness and irritation. 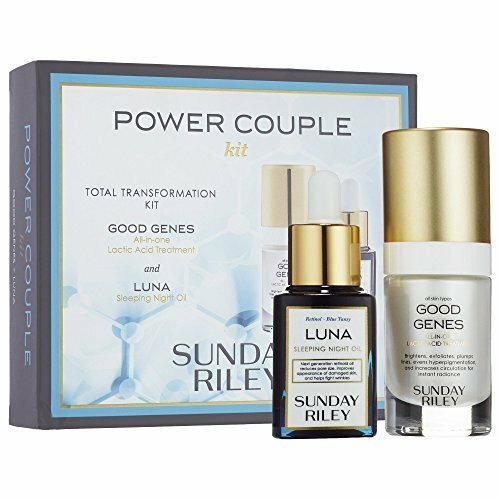 A transformational power product duo that combines lactic acid and trans-retinol ester to exfoliate and brighten the skin. If you have any questions about this product by Sunday Riley, contact us by completing and submitting the form below. If you are looking for a specif part number, please include it with your message.